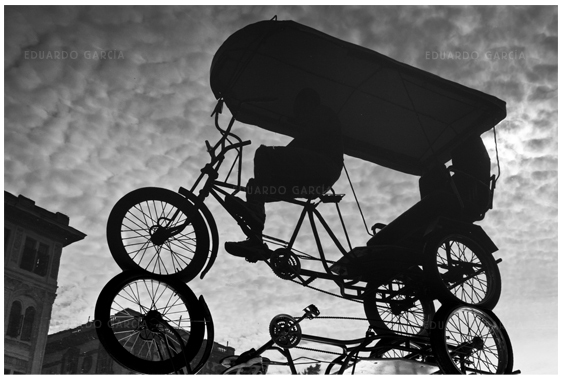 When I started this series, I thought it would be very difficult to find street photographers in Cuba. 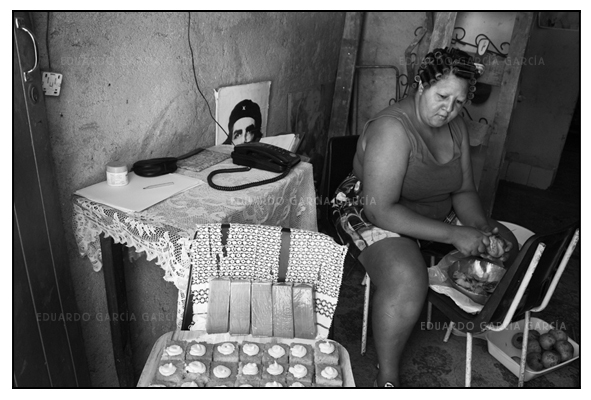 I guess I got lucky because we ran into a small photography fair on our first day in Cuba. 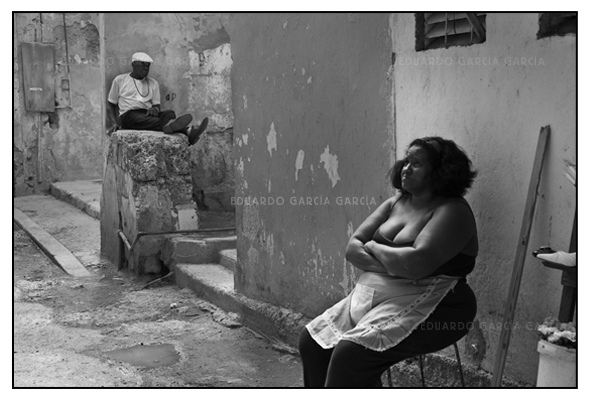 Indeed, the work of several street photographers were exposed on Havana’s main street and proposed for sale. After having a quick look at the various displays, I spotted a stand whose street photographs were in my opinion a notch over the other ones. It is at that point that I met Orlando Garcia. I introduced myself and asked him whether I could interview him on his work. He gladly accepted and we conviened to meet again another day. 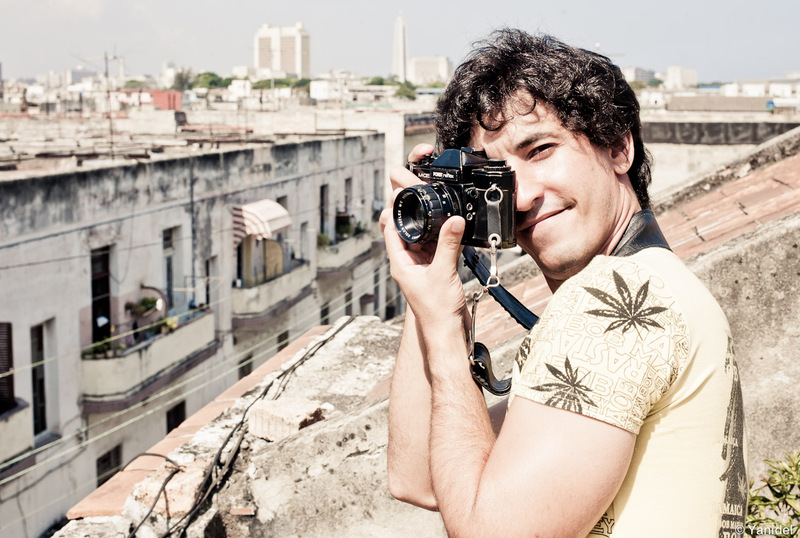 Orlando with his Porst camera on top of the family house’s roof. A week later, Orlando invited us to his house to show us more of his amazing work and discuss about his brief but promisiong career in photography. Though Orlando has a degree in engineering, he decided to enter the photography business a year ago, probably influenced by his twin. Together, they also work in the audio-visual business, developing short animated films for ad companies. Both are well connected to Cuban photography circles and are part of the Fototeca de Cuba. Despite being a full time photographer for a short amount of time, I was very impressed by his work, I believe that Orlando definitely has an eye. Note that he uses a entry level DSLR, a Canon Rebel, and his early work was produced by an analog Porst camera mounted with a 28mm lens. Note that Orlando’s pictures illustrating this article are part of portfolio that Orlando copied on my SD card. I did not realize at that time that they had watermarks on the whole picture. I apologize for that, but due to the difficulty to get internet access in Cuba, it would take too much time to get other ones from Orlando. I usually shoot three days a week. I like to have intensive outings so I’ll basically be out in the street from 8h to 15h and then 18h to 20h. When the light is too strong, typically around midday, I’ll head to places that are protected from the sun. I like to enter the common parts of houses and see if something is happening inside. 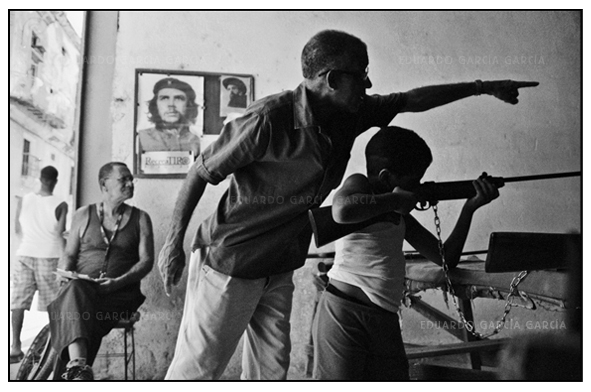 II) How do you interact with people in Cuba ? I shoot a lot in small villages of the countryside, so after taking a few quick shots, I’ll introduce myself to the settlers. I often take a booklet around so they can see my work. Once accepted, I am basically free to shoot as much as I want. I don’t ask people to sign model releases, it is not really needed in Cuba. Nevertheless, I sometimes offer to send my subjects a print afterwards, they always appreciate it. III) How do you make a living from photography ? I basically sell my pictures to tourists in street fairs. Moreover, groups of photography experts that come from the US also are a good source of income. With that, I can eat and get the resources to work on other projects. I have been experimenting lately with some fine arts fashion shots. I’d like to get more involved in that domain and maybe sell my work to ad agencies. Thanks you Orlando for receiving us at your home. Orlando does not have a website yet but plans to work on it in the coming months. I look forward to see his future work and will post a link here when it is up. Good photos! I see Henri’s eye here. I like them! Definitely some high quality material here ! Glad you ran into him ! très jolies photos, intéressantes, bon cadrage en général, et traitement en N/B ok. Photographiquement, Eric.